In North America, we still have the rare opportunity to protect ecologically significant lands and the wildlife that depends on it for survival. But protecting and caring for land in just one country is not necessarily enough for a species to thrive. 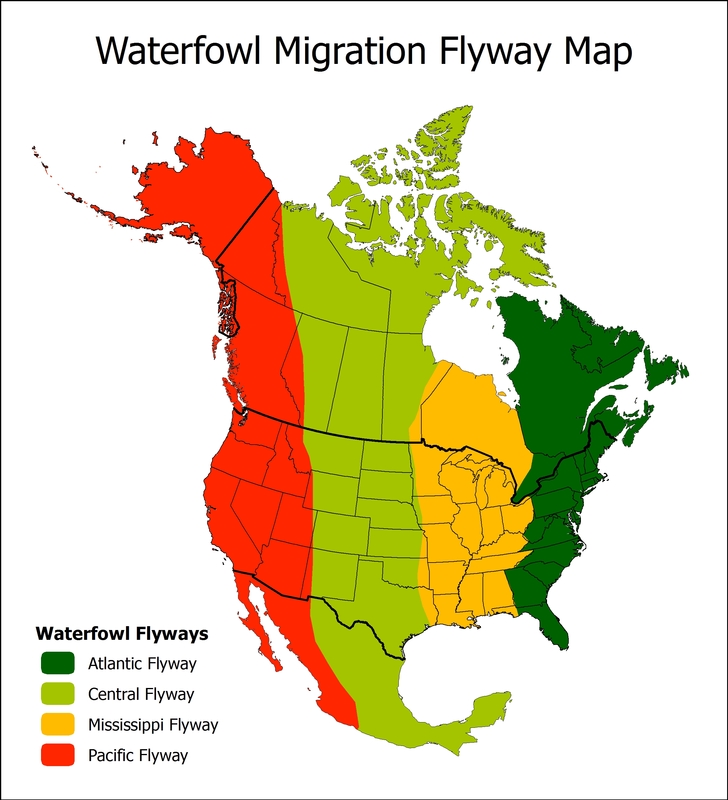 These colors represent the four major “flyways” or migration routes that are used by North American waterfowl. AFNC supports conservation work in all four flyways. Species cross borders. Many of the birds and other wildlife found in the United States are shared with our neighbors in Canada. Birds such as Piping Plover and Northern Pintail spend their winters in the United States, but go north of the border to breed. Estimates indicate that close to 70% of all North American waterfowl breed in Canada. Yet one of the core foundations of North American bird abundance – the wetlands of Canada – are under constant threat from intensification of agriculture and the pressure for development. Currently there is an incredible leverage opportunity for U.S. donors – most U.S. dollar raised for wetland conservation work in Canada can be matched 3 to 1. While not all U.S. gifts can be matched 3:1 (there is an annual limit to the matching amount of approximately $1.5M per year) we would be delighted to discuss all the options. The match is partially funded by the U.S. and Canadian governments; however, without donations from U.S. residents, foundations, or corporations to get the ball rolling these ‘available’ funds are inaccessible. And critical conservation work that supports wetlands, associated uplands, waterfowl and other migratory birds that are tied to U.S. interests is not being accomplished. AFCN is partnering with the Nature Conservancy of Canada (NCC), Canada’s largest national land conservation organization, to help raise funds to protect habitat and species that cross borders. The two organizations are working in partnership to conserve landscapes that benefit both Canada and the U.S. Together we can help protect our natural heritage so our grandchildren’s grandchildren have the possibility of seeing the same birds in the sky that we grew up with. The North American Wetlands Conservation Act (NAWCA) of 1989 provides matching grants to organizations and partnerships to carry out wetland conservation projects in the United States, Canada, and Mexico. AFCN’s partner, the Nature Conservancy of Canada (NCC), is one of only three organizations currently accessing matching funds through this initiative in Canada. Supported work focuses on protecting, restoring, or enhancing wetlands and other migratory bird habitats throughout the country. Learn more here. NCC has been a grantee of the program since 2001 and is part of multiple Joint Ventures to help ensure a coordinated approach with the many fantastic organizations that are working to protecting wetlands, waterfowl and other migratory species. Both AFCN and NCC are committed to ‘no random acts of conservation’ and all projects are part of a sophisticated conservation planning process. Please consider donating today !